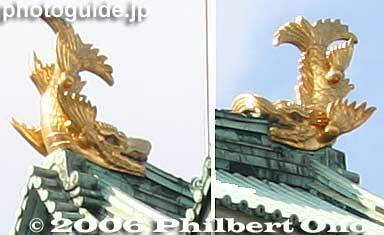 Symbol of Nagoya, golden shachihoko. Killer whale or fish with a tiger's head. First believed to protect the building from disasters, but later served as the symbol of the castle lord's authority. The original pair was destroyed along with the castle tower during WWII, but they were remade in 1959 along with the castle tower. Later, they were recoated with gold. They gleam very well on sunny days. The male fish is on the right (north), and female (south) on the left.